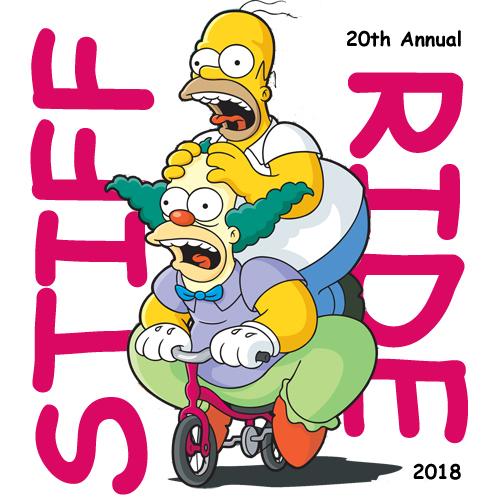 2019 will mark the twenty-first year Team Stiff will sponsor the 3rd Annual Stiff Ride, (a.k.a. Ride With a Stiffy, a.k.a. Le Tour de Rigide). Although an official count was not taken due to extreme inebriation, last year's Stiff Ride witnessed the largest attendance yet with many RAGBRAI teams represented. Some die-hard biker bums traveled from as far away as Illinois, Missouri and Wisconsin especially for the nirvana-like experience that is Stiff Ride. Is the Stiff Ride for you? Take this simple quiz. Are you the type of RAGBRAI rider who has trouble getting into camp before dark? Have you sustained numerous cracked ribs from doing beer slides on RAGBRAI? Do you salivate for the taste of beer whenever you see a water tower on the horizon? Are there embarrassing pictures of you on multiple RAGBRAI web sites? If you answered 'yes' to any of the above, the Stiff Ride is a must do for your 2019 ride calendar. The Stiff Ride is renown for preparing one's liver and beer-legs just in time for RAGBRAI. 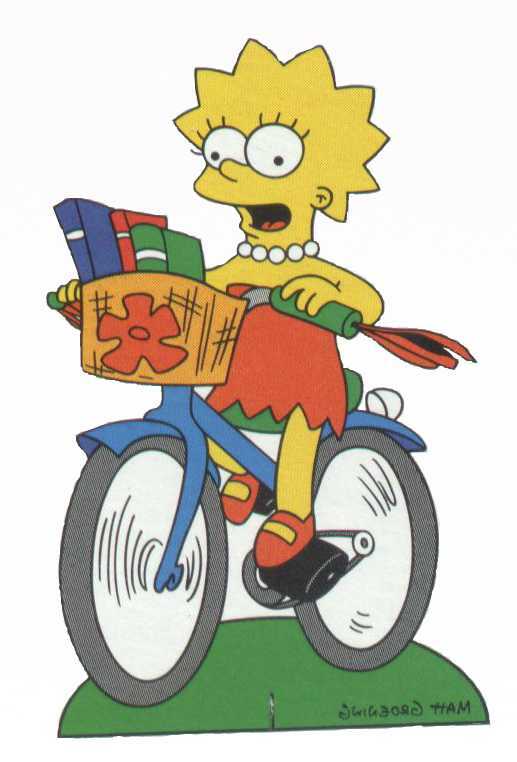 The June 2005 issue of Bicycling magazine selected the Stiff Ride as its 'Cool Ride of the Month'. If you need more convincing, watch this YouTube video featuring Team Stiff mascots Stiffy & Limpy. Saturday, June 22nd, 2019 11:00 a.m.
Leg 1: The Stiff Ride will begin in the parking lot of the New Shack Tavern, located in Cedar Rapids at 2545 Old River Road, S.W. We will ride the Cedar River bike trail to Ely. Route arrows will be placed at intersections along the route indicating which way to turn. The first rest stop along the route is Odie's Bar located in the charming village of Ely, (approximately 7 miles ride from the New Shack Tavern). If you play hacky sack, join us in the hacky circle behind Odie's Bar. Leg 2: After we devour all the beer and food at Odie's Bar we press on for 16 miles to the quaint, riverside hamlet of Sutliff. 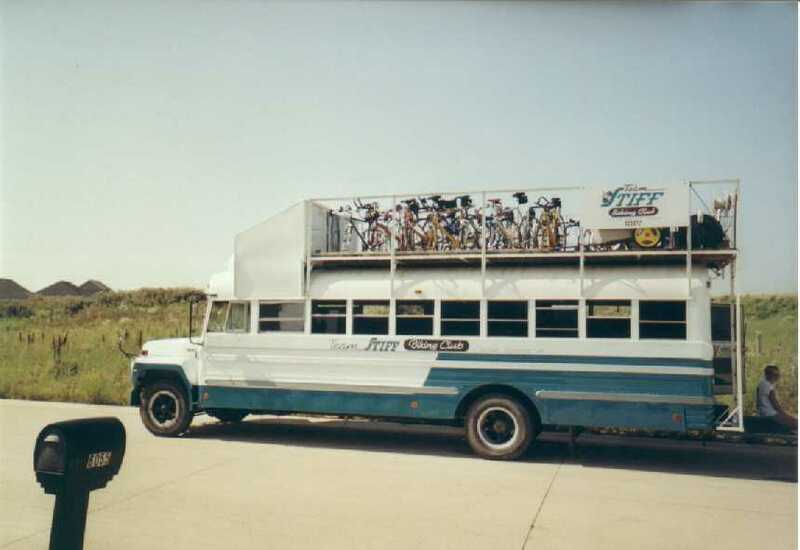 Between Ely and Sutliff, be sure to look for the Team Stiff Bus along the route for a delightful respite at the Beer Oasis. Baxa's Sutliff Store & Tavern will serve burgers, hotdogs and beer throughout the day to all bikers. Enjoy the river side view, the historic Sutliff Bridge, and a round a hacky sack with fellow bikers. Leg 3: The mileage from Sutliff back to New Shack Tavern is 14 miles. 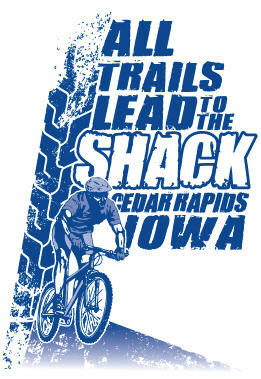 A post-ride party will be held at New Shack Tavern to conclude the day's events. Click here to view how much fun the post-ride party can be, especially when lick-on tattoos are present. Click Route Directions and Route Map to download PDF files for the Stiff Ride route. The Shueyville Loop: For those bikers who want to ride some extra miles and take a different route back to The New Shack Tavern, you can take a left turn to Shueyville, have a beer at Shuey's bar, and then head north and east back to Cedar River bike trail and the Shack Tavern. 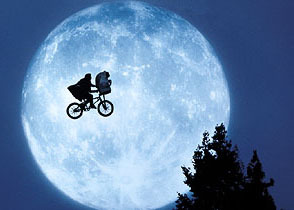 Riders are encouraged to bring bike lights and blinking reflectors, as it has been the experience of many a rider to have too much fun to return to Cedar Rapids before sundown. Click here to view how you might look once you return to the Shack Tavern at the end of the day. 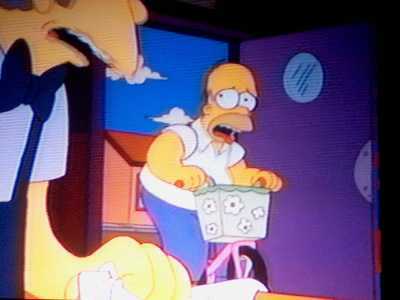 As always, Team Stiff highly recommends you wear a bike helmet during the ride. There is an area next to the New Shack Tavern that can be used to pitch a tent. So bring your tent and plan for a full day and night of biking and partying. Sorry, but no showers are available. There is no registration fee for the Stiff Ride. If you would like to let us know that you plan to ride with the Stiffies, go to our Facebook Event Page and select Going. Pre-registration is not required, but it enables us to tell the bars how many riders to expect. Bring money to purchase your own food and beverages at the bars along the route. Stiff Ride souvenir patches, window stickers and posters will be available for purchase the day of the ride Patches are $5.00 each, window stickers are $1.00 each, and posters are $10.00 each. Quantities will be limited. 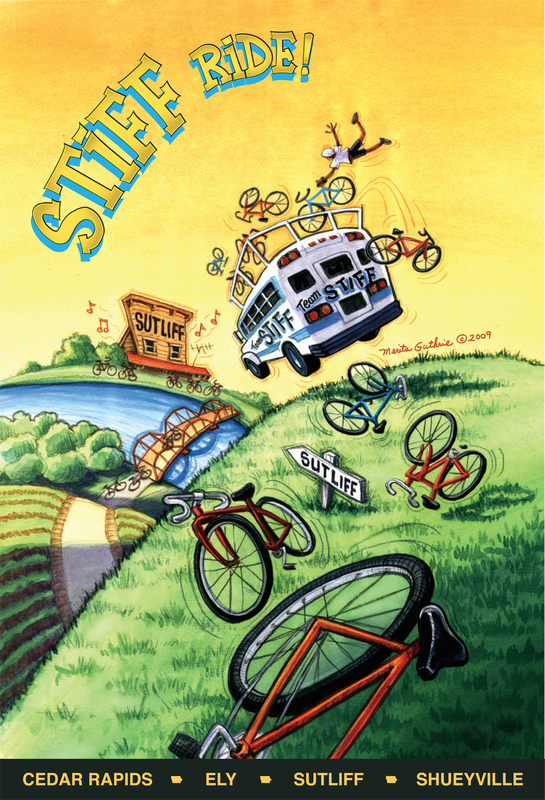 To purchase a poster, patch or window sticker in advance of the Stiff Ride, contact dave_wedemeyer@yahoo.com. 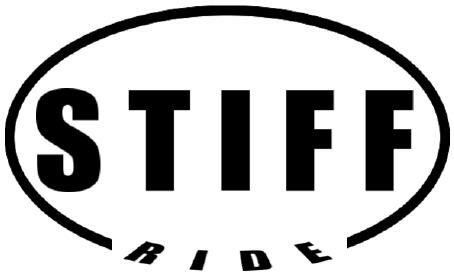 Click on this link to purchase Stiff Ride patches from previous years. Team Stiff would like to thank these Cedar Rapids area businesses for their sponsorship.